I was sitting around planning out blog posts the other day and a fantastic idea for a blog post series came to mind: a mini Friday playlist of ten of my favourite songs from the shows! Of course, this countdown isn't totally accurate in all places. I did start with a list of over 200 songs that I really like from the shows, but I slowly had to reduce that to 100 as I ranked them - some poor shows don't even show up in the final list at all! 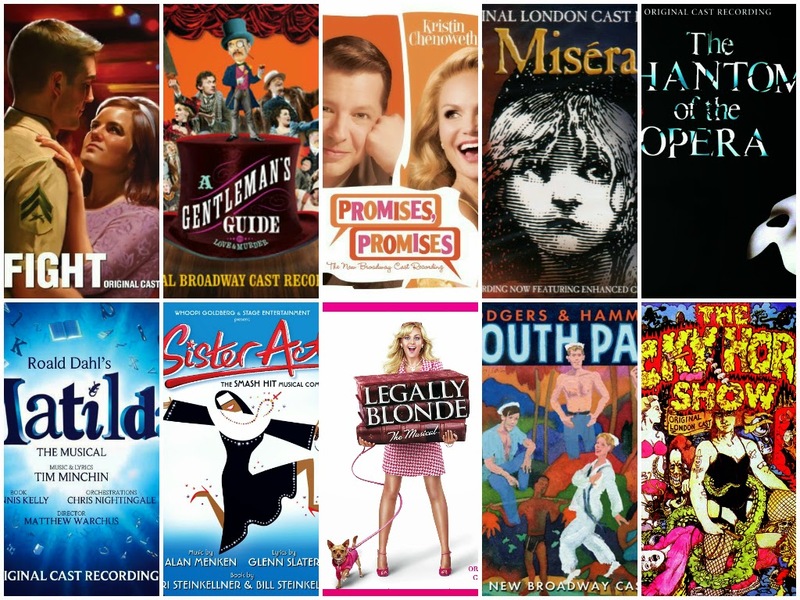 Regardless, every Friday you can check out another ten show tunes and hopefully, you'll enjoy them as much as I do! Another stage show/movie duo is this Rodgers & Hammerstein classic. I was lucky enough to catch the UK tour that went around back in 2011. It was a show that was much more appreciated upon reflection, and the most recent Broadway cast recording with Kelli O'Hara and Matthew Morrison is lush! A show that we all most definitely know about is Les Miz. Popular for being one of the longest running musicals on the planet and for now being a successful Hollywood movie, I felt like this song needed to be included somewhere just because I seem to always be listening to it! We all know how much I love Dogfight after my review on the recent Off-West End production. An outstanding show with some even more outstanding music; this song is so catchy. Phantom is arguably my favourite musical of all time, and this song is even more haunting each time you listen to it. This version is one of my favourites ever just because of Sierra Boggess and Ramin Karimloo. What an incredible pairing. I have absolutely adored this show ever since I heard the first bar of the soundtrack when it was first released a few years back. All of the songs are stellar, but this song always stands out to me. Beautiful, moving, and perfectly simple. Promises, Promises is a show that is notorious for being a show about... well... no one really knows to be honest. It is, however, remarkably funny in its randomness and this weird song (sung at an office Christmas party) is proof of this fact. This show's soundtrack is packed with some incredibly fun songs, but this song really stands out. It's just so much fun, and Patina Miller is amazing as per! This show was very popular with the younger generation when it first opened so thank God I love the soundtrack because my friends most definitely do! Perhaps a corny show, but I went and saw it twice and I've done a workshop on the show because I love it that much - #awesome.